Chico, CA - On Tuesday, May 15, 2018 Chico State had a Native American graduation celebration to recognize local high school, Butte College and Chico State graduates. Come Back Butte Charter Class of 2018 graduate, Phelan Fred, was honored. 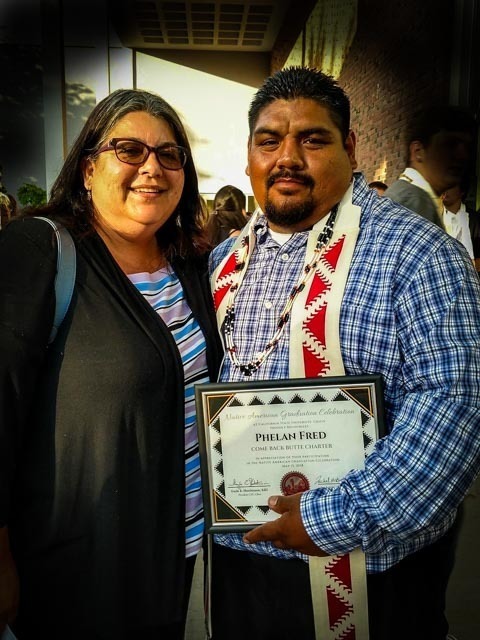 Phelan enrolled at Butte County Office of Education's Come Back Butte Charter School in March 2017 to earn his high school diploma. On June 4, 2018 Phelan will receive his high school diploma. He plans to attend Butte College in the fall. Phelan finished what he started at Come Back Butte Charter! At BCOE's Come Back Butte Charter School, students receive the opportunity to complete high school graduation requirements and obtain a high school diploma and to prepare for college, vocational programs or Career Tech Education programs (CTE).